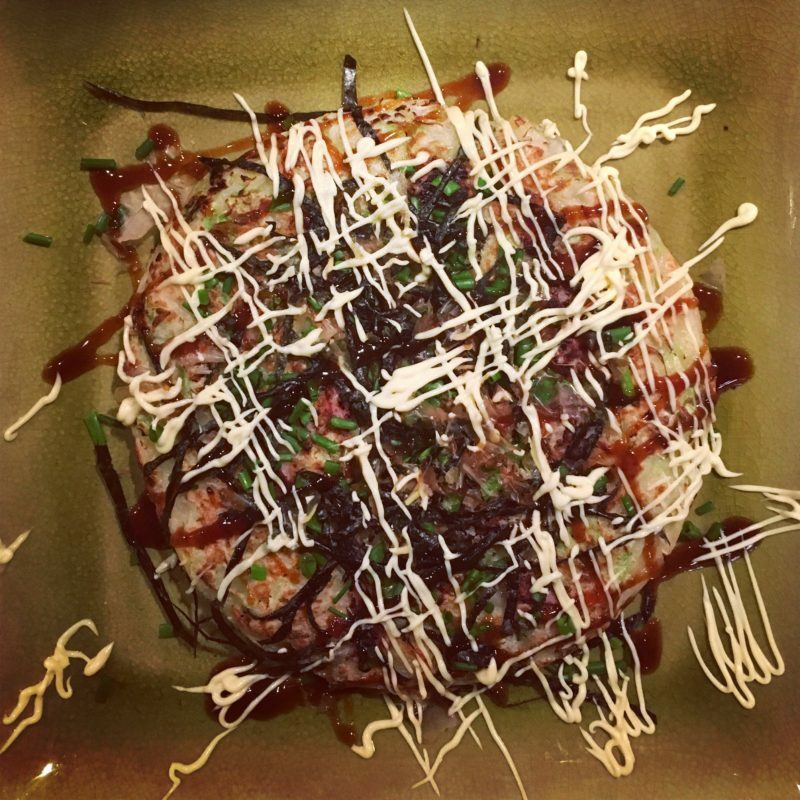 Okonomiyaki is a Japanese dish. It’s a type of pancake with cabbage. Foreigners often call this “Japanese pizza”, but I don’t think it is a good analogy. 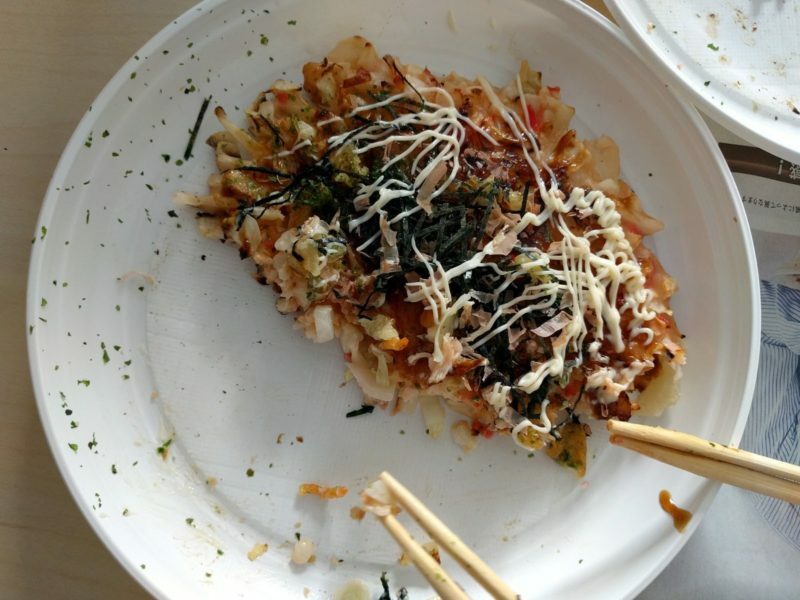 Okonomiyaki is a flag dish of Hiroshima prefecture and city, although it is popular also in Osaka and the whole Kansai region. The Kansai version and Hiroshimna version are a bit different but both are delicious. 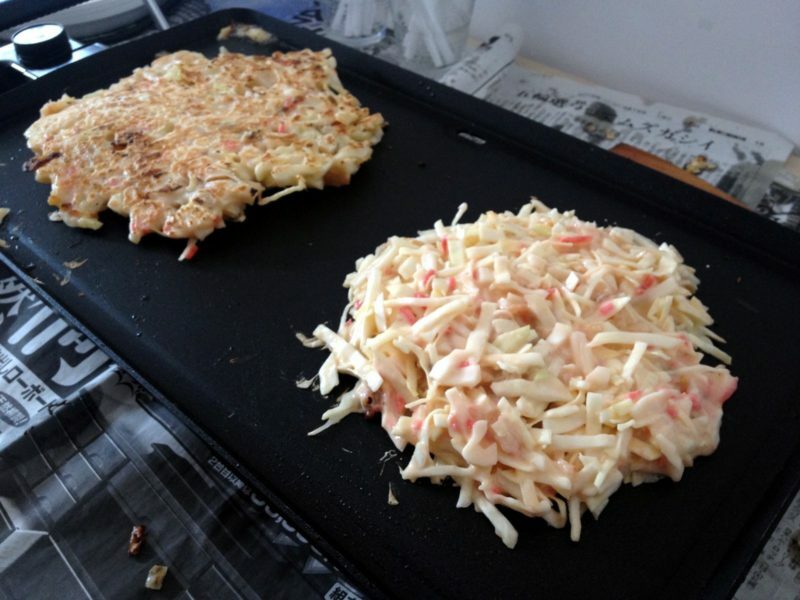 I’ve learned to prepare Konomai-style okonomiyaki from a Japanese cook some time ago. Hence, I often prepare this dish at home. 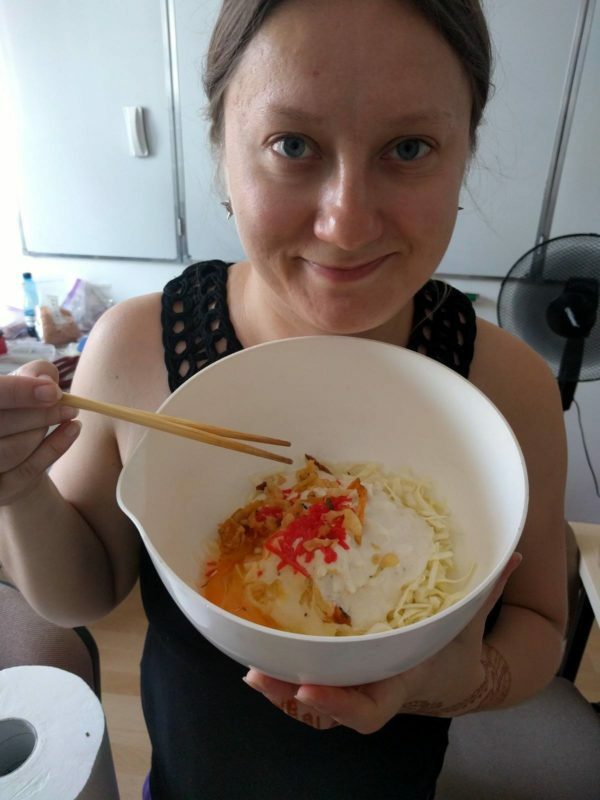 Today I share with you the super-easy recipe for okonomiyaki Kansai style. Okonomiyaki are usually served in the restaurants with the large teppan (metal griddle) built into a chef’s counter or the guests tables. It the teppan is in your table, then you are probably expected to prepare okonomiyaki by yourself. 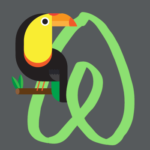 And believe me, this is a really cool experience! I used to do that with my fiance twice. Once in Hiroshima and once in Osaka. And it wasn’t hard at all! That is why I decided to make okonomiyaki also at home. And you can do that too, using a regular metal pan. Some may think that the ingredients listed below are difficult to get outside of Japan. But they are easily accessible in shops with Asian food and Asian sections in supermarkets. I easily get them in Warsaw, Poland myself. Nonetheless, you can always order them on-line (you may have difficulties with getting dried shrimps. In such case just use the frozen or fresh ones). Make the batter out of the first four ingredients (wheat flour, water, milk, dashi broth powder) and set it aside for a while (preferably in the fridge). Cut the cabbage finely. Pour the batter over the cabbage, add egg, ginger, small dried shrimps and tempura flakes. Mix everything thoroughly. Pour the mass onto the hot pan and form a pancakes with a diameter of approximately 15-20 cm and thickness of about 1.5 cm. You may press them with spatula a bit. Fry the pancake until it is slightly condense. On the top side of the pancake, place two or three slices of bacon and fry for a while. Turn the pancake and fry for about 1-2 minutes, turn it over again (bacon up) and fry for a while. Remove the pancake from the pan. Sprinkle it generously with nori seaweed cut into thin stripes or aonori powder or chives (or everything – you can add to okonomiyaki the toppings you like*) and katsubushi flakes. Finally, splash it with okonomiyaki sauce and mayonnaise. In Japan they have a special mayonnaise and mayonnaise bottles with the perforated cap, which enables to decorate okonomiyaki with thin lines of mayonnaise. *) Okonomiyaki (お好み焼き, o-konomi-yaki) – the name of the dish is derived from the words konomu (好む) meaning “like” and yaku (焼く) meaning “to bake”, “to grill”. 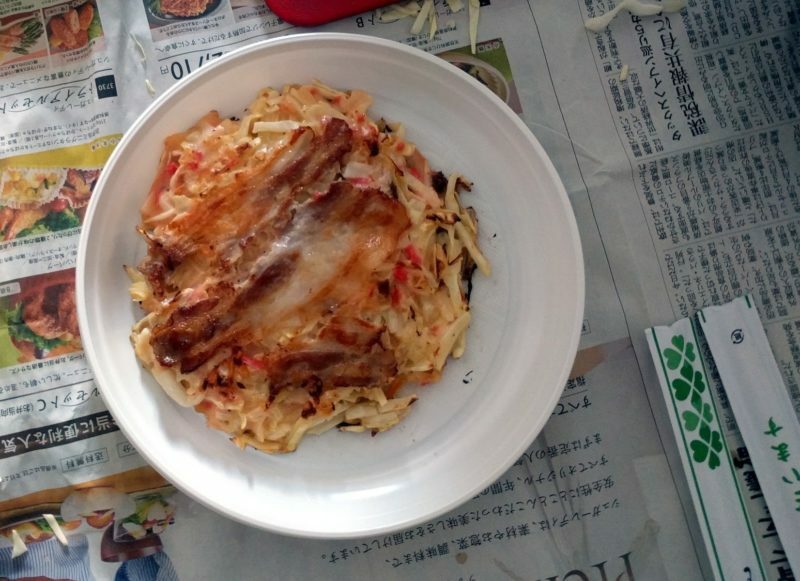 I hope you will try my recipe for okonomiyaki Kansai style. If you do, please share the comments and the photos! 🍜 Want to learn more Japanese culinary terms? 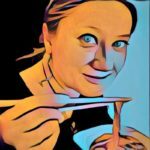 Check my Japanese Food Index page I am expanding!